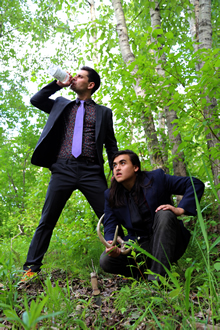 Everything about Folk Lords (playing at the Toronto Fringe Festival) is pleasing — and I do mean everything. If you pass up this hilarious and hyperkinetic tribute to lore and literature, you’re missing one of the most interesting, compelling and viscerally thrilling pieces of theatre you’ll see this season. The concept is difficult to describe without making it sound boring, but essentially, Houseman and Gorodetsky are going to improvise three stories for you: a creation myth inspired by the Cree oral tradition (“how the peacock got its feathers”); a dire Chekhov play (a farmer dies slowly of consumption and it is Deep and Meaningful and Poetic); and a final narrative defined entirely by an audience suggestion. I saw a Hitchcock thriller, but it could just as easily be an Archie Comic, a bodice-ripper, a teen comedy or an educational film. Because Houseman and Gorodetsky alternate between these three universes, the usual lulls and fizzling we’d expect from an improv show — some sketches will work, some don’t — don’t manifest. Instead of running a sketch into the ground, we move to the next world, and the next, and we keep alternating as needed to keep the energy high. And it helps that these two are uncommonly good improvisers, consistently game and off-the-wall, but perfectly in sync with one another. This chemistry is most obvious in their physical work, perpetually two steps ahead of each other — and exactly where their partner needs them to be. But the point of Folk Lordz isn’t just to have fun: it’s to make us more aware of myths, storytelling, and the cultures and experiences which surround them. Above all else, Houseman and Gorodetsky have a reverence and respect for their chosen genre, and it’s an affection they’re eager to share with audiences. Take them up on this offer: it may sound hokey on the way into the theatre, but riding along is so, so worth it. Two final thoughts: I think this piece would be of immense interest to young people, probably from ages 8 and up; I also think this is an ideal date show. You’ll bust a gut laughing, and you’ll feel smarter afterwards, which will give you plenty to talk about on the way home. Photograph of Ben Gorodetsky and Todd Houseman provided by the company. Thanks for the ticket to this one. The guys’ commitment and quick transitions were great. My one negative was that the voices were sometimes projected sideways across the stage, making it hard to hear in the audience. I agree, this could be mounted for kids.